Tired of depending on external sources to heal? Self-healing is the ability to heal on your own with your innate strength. …is the ability to restore the body, mind and spirit to its original state. …is the intuitive ability to know and provide the specific needs of your self in time and space. ARE YOU HINDERING YOUR SELF-HEALING? Learn to reactivate your healing potential. Welcome to my site. My name is Lilly Lei, M.D. I’m a physician with a background in both Western and Eastern medicine. I specialize in Self-Healing. It’s the best medicine I can give to my patients. Based on the notion that we’re all born intuitive. Few has cultivated this ability; most have not, but we should, If we want to experience optimal health and wellness. I created the program JOURNEY INTO THE SELF FOR HEALTH & WEALTH to help you re-learn to self-heal. It accelerates your self-discovery while unfolding your intuitive healing abilities, and re-train you back to listen to your true voice for success. I’m formally trained in Internal Medicine, Physical Medicine & Rehabilitation, Restorative Neurology, Non-invasive Pain Management, Acupuncture, TCM, Medical Qigong or Chi Kung), Chinese Astrology and Feng Shui. Seems like a lot of training for one person and one lifetime. However, my “real” education did not come from schools or millenary body of knowledge. It came from my experience with personal and family health challenges and my desire of not having to depend on medications forever. Healing is a natural process, like breathing. But many times our deep-seated beliefs, unintended attitudes and actions get in the way. My mission is to heal the world with a JOURNEY INTO THE SELF FOR HEALTH & WEALTH, one person at a time. "Helpful, relaxing, pleasant, natural, interesting"
…and also Dr. Lilly is an excellent coach, nice and proifessional person. Thank you! Peaceful feeling. Great for well-being and peaceful, relaxed feeling. Lilly Lei is an extraordinary chi gung teacher and guide. Many years ago a very diverse group of us studied medical chi gong with her. We are all still practicing some form of chi gung and we still have a bond with each other after all these years. For me, it has led to a lifestyle of pursuing energy-related activities including becoming a Reiki master. She was also instrumental in motivating my husband (at first a firm non-believer) to study chi gung and become an instructor in several senior centers. I remember the practice feeling very strange at first, but with time and patience (hers and mine) I began to feel the energy flow and my health improve. Lilly not only introduced us to chi gong but also other aspects of healing arts, ie the study of The Five Elements and uses of and techniques of fasting. 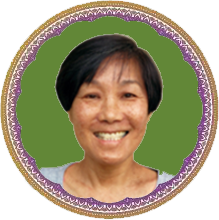 She has great knowledge of the healing energies of chi gung, and also great wisdom for our lives which she conveys with humor and enthusiasm. I was introduced to Qigong in 2000. At the time I was going for acupuncture with Dr. Lilly Lei. Who introduced me too Qigong. Little did I know it would grip me for a lifetime. To this day I still practice regularly. I can’t say enough to how it has helped me over the two decades emotionally, physically and spiritually. Whether it be to move past a decade long debilitating chronic Lyme or the loss of a beloved. Qigong has been a good friend helping me to heal,awaken and evolve in mind, body and spirit. 1st and 2nd International Health Qigong forum. Of all the methods I’ve tried; I still come home to Dr. Lilly‘s. It never gets old and continually evolves. At times even miraculous. I am so very grateful, Lilly. You have given me a gift that has made all the difference in my world.